My sister, Linda, wrote this post. It is a story I had never heard! The funny part is...Linda and I do not eat fish...and this is a fish story. I hope you enjoy this as much as I did. Growing up outside of Indianapolis, our family rarely had any fish or seafood on the dinner table. When visiting our grandparents, on the Mississippi River, there would occasionally be fresh water fish that my grandfather or dad caught, but their fishing was more recreational than anything. 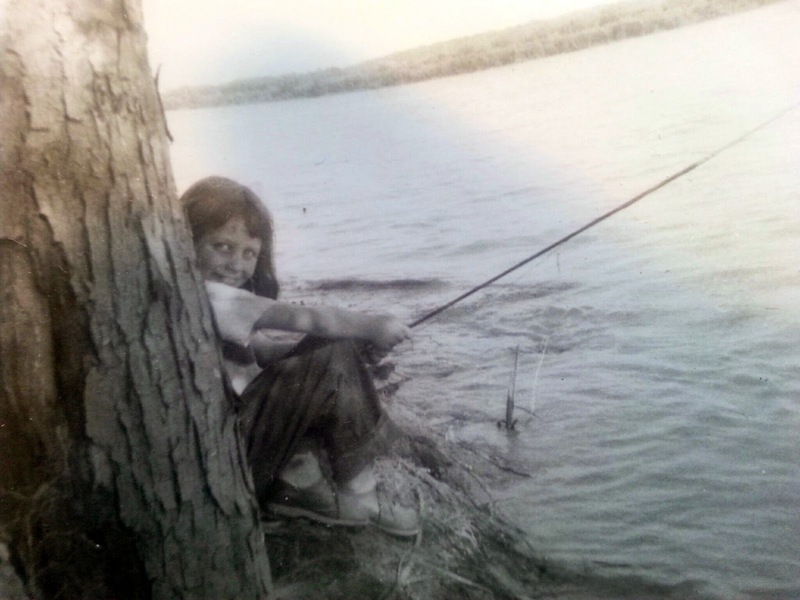 Jackie and I would "fish" with a bamboo pole and bobber and once in a while a sunfish or tiny perch might grab on, only to be thrown back, which was always a relief. Maxine had developed a taste for lobster rolls on her honeymoon. Over her life she would occasionally try one at a restaurant and declare it was not nearly as good as the one she had on the east coast with dad those many years ago. The Midwest is not the place to sample lobster rolls. 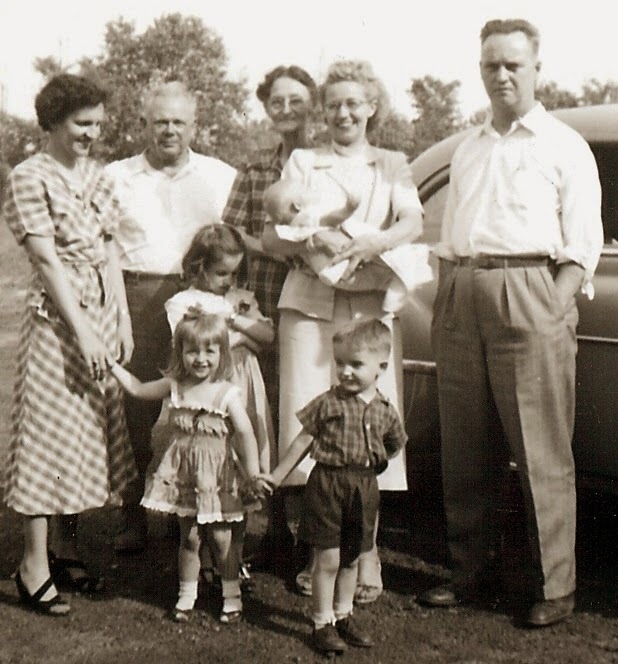 Every Sunday, after church at Roosevelt Temple, my mom and dad would have Sunday dinner with our cousins, the Halls, Dorothy and Al. 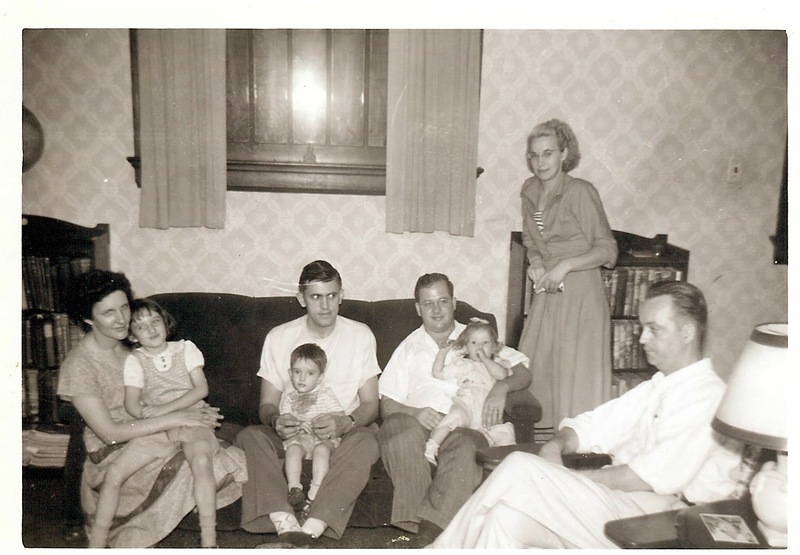 In their early married life, there was also Tim and Susan, and following along in 1948, Mark and myself, and then Jackie in '51. Sometimes we would have dinner at home and sometimes eat out at McLaughlin's Cafeteria, where if Mark and I behaved, we were given change to walk down the street and get chocolate cupcakes at the Roselyn Bakery for dessert. The Clam Chowder story happened before I was old enough to remember it myself, but it was one of my favorite stories about one of Dad's special gifts....sharp eyes! Dad was one of the most observant people I have ever known. He never missed a chance to point out a groundhog peeking up from a culvert along the road, a deer still as a statue at the edge of a grove of trees. In the springtime, he was always bringing home little "gifts" for my mother of silk scarves and cardigan sweaters which had probably flown out of convertibles and fell along the side of the road for him to fine. This was in the day before credit cards and ATMs, so they emptied their pockets and purse to count up their resources to finance the clams. They were woefully short. Dad said, "Let me think," and proceeded to drive around in silence. As Maxine told later, after only a few minutes, he braked the car and pulled to the side of the street, opened the door, walked back half a block, leaned over, picked something up and returned to the car. He tossed a beat-up little leather coin purse in her lap and said, "Maybe there is something in this." When she opened the coin purse, there were several bills and coins inside, and YES, 'just enough' to buy the clams. To hear them tell the story, they lost so little time finding the funding that when they arrived at Dot and Al's, it was just time to add the clams. Love this. Divine intervention perhaps? A good thing your dad had such sharp eyes. Such a gret story to pass on. Glad your sister shared it with you and you with us. Your dad did have sharp eyes! Wonder how the clam chowder tasted. Midwest is definitely not a seafood source. Love these snips of life in a simpler time! That's about as far out as many fish stories I've heard!!! But since you're sharing it, I believe it. They were "supposed to" have chowder that day, for sure!! I love the picture of Linda fishing. Some of my fondest memories are of fishing on the lake. I have never heard of anyone catching sunfish before. We used to catch them all day long, put them in a huge bin, count them at the end of the day and then pour them back into the lake to catch them the next day. Those are some great memories. I can bet yours are as great as mine. Thanks for the memory lane trip.